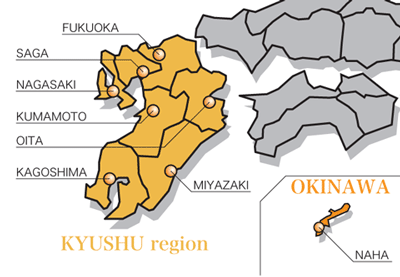 Kumamoto City is located in the center of Kyushu, the southern major island of Japan. The city is blessed with rich greenery and abundant groundwater in the volcanic pyroclastic aquifer created by Mt. Aso. Thanks to the abundant groundwater, the drinking water for its 730,000 citizens is totally supplied by groundwater. Kumamoto is the largest city which supplies all drinking water with completely natural groundwater among the cities in Japan which have populations of more than 500,000 inhabitants. This has earned Kumamoto the title "The home of the richest groundwater in Japan". The city has been undertaking various efforts to maintain their abundant, pure and crystal-clean groundwater so as to pass down this treasure to their future generations. The volcanic Mt. 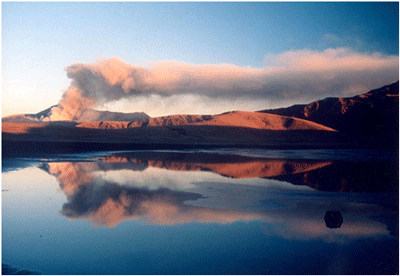 Aso experienced violent eruptions with pyroclastic flows for four times during 270,000 to 90,000 BP. The pyroclastic flows deposited and accumulated to more than 100 meters in thickness, and became an ideal groundwater aquifer of this region. In addition, about 400 years ago, Kato Kiyomasa, the feudal lord of Higo (old name of present Kumamoto), promoted the development of paddy fields along the Shira-river alluvial low land, which is easy to permeate and recharge local groundwater aquifer. This situation resulted considerably well and allowed Kumamoto access to a far greater amount of clean groundwater. In other words, the achieved system of creating groundwater in Kumamoto can be considered to be a combined work of the "natural system" of Mt. 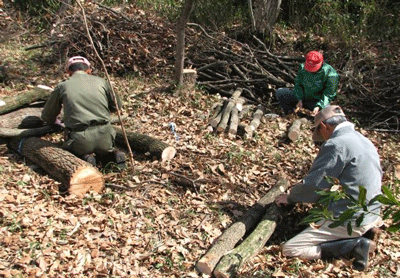 Aso and the "local human activity" made by many individuals represented by such as Kato Kiyomasa. Tap water in Kumamoto City comes from groundwater, which is chlorinated only at a minimum level without further purification. As a result citizens can drink "mineral water from the tap". In cooperation with neighboring municipalities, Kumamoto City government has managed artificial groundwater recharge system using abandoned paddies and protected watershed forests. By protecting the natural systems and conserving Kumamoto's high-quality groundwater, the city can provide its citizens with high quality "mineral water from the tap". Kumamoto city does not have an alternative source for groundwater, and may face a crisis when the groundwater dries up or is polluted. Kumamoto used to be called the 'City of Forest', but with rapid urbanization since the early 1970s the amount of groundwater that percolates has decreased while water use has increased. The decline in groundwater recharge levels from paddy fields, which is due to the practice of converting paddy fields to dry fields, has accelerated the fall in groundwater levels. One third of Kumamoto region's annual groundwater recharge of about 640 million m3 comes from the recharge of paddy fields. With declining rice consumption and low prices, less land is used for rice production, with a substantial decrease in the recharge through these fields. The use of paddy fields for rice production has dropped to about 50 percent of the areas that used to be paddy fields. It has also become imperative to take countermeasures against groundwater pollution caused by excessive nitrogen from fertilizers and livestock waste. 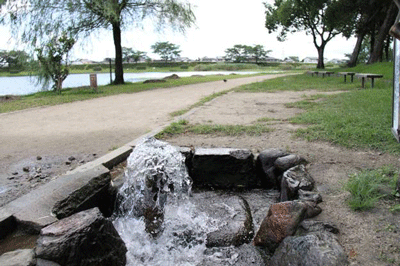 Kumamoto City has carried out various initiatives to conserve its groundwater, including the adoption of the Declaration of the Groundwater Preservation City in 1976, and the installation of groundwater observation wells in 1986. As part of these efforts, the city has conducted research on groundwater flow system of the area. According to those groundwater observation, well monitoring and groundwater flow system study, the most record by those groundwater observation wells showed long term decreasing tendencies. This was mainly due to the decrease of groundwater recharge which was mostly caused by the land use change in the recharge area in last 30 years. Research revealed that the groundwater recharge depends on the farmland and forests in the upper and middle basins of the Shirakawa River and the Midorikawa River, which run through the towns of Ozu, Kikuyo and Mifune, municipalities located in the east of Kumamoto City. As a result, the city needs to cooperate with neighboring municipalities in order to conserve groundwater. The city formulated an agreement to maintain and increase the groundwater recharge through cross-municipal cooperation. Major cooperative initiatives started in 2004. It included a project to flood in the converted paddy fields of mid-basin of the Shirakawa River and to maintain the watershed protection forests in the upper basin. 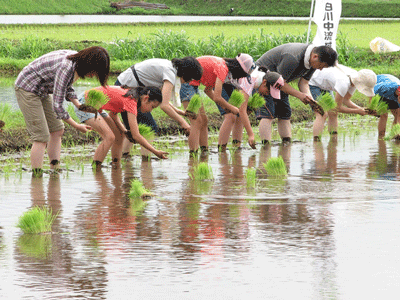 In order to maintain the recharge from paddy fields Kumamoto city started a flooding project through the cooperation with the Council for Sustainable Water Use in Agriculture, which consists of Kumamoto City, Ozu and Kikuyo towns, four local Agricultural land improvement districts, JA (Japan Agricultural Cooperatives) Kikuchi and JA Kumamoto City East Branch, in 2004. The project provides subsidies to encourage farmers to flood their converted paddy fields with water from the Shirakawa River everyday for one to three months between May and October. Farmers may flood their fields after harvesting and before planting and growing crops. The amount of subsidies depends on the length of flooding periods. The flooding is effective not only to recharge groundwater levels, but also to limit negative effects of weeds, insects, diseases, and continuous cropping troubles. Moreover, flooding helps to reduce the use of agricultural chemicals, prevents groundwater pollution and reduces financial costs. To ease the fall of rice prices, caused by the decline in rice consumption and surplus of rice, the government of Japan has limited areas and amounts of rice production. Farmers are forced to produce crops other than rice in their paddy fields. These fields are known as "converted paddy fields." Converted paddy fields are not flooded when they are used for cultivation of crops other than rice, and therefore do not contribute to groundwater recharge. Rice production requires a particularly long period of flooding of four to five months. In this area, the production of one kilogram of rice results in a groundwater recharge of about 20 to 30 m3. As such it is important to encourage that rice production is continued and the local farm management stabilized. Rice and vegetables produced in this area have subsequently been marketed under special brand name 'Gift of Water'. In the past, the major tree species planted were conifers for the forest industry. Since 2004, however, increased planting of broad-leaved trees has taken place, in order to improve recharge capacity of the forests. At the same time the forest industry is declining. From the perspective of biodiversity, the increase of broad-leaved forests is expected to provide more habitats for a wider variety of species. Groundwater conservation cannot be achieved only by increasing recharge capacity. 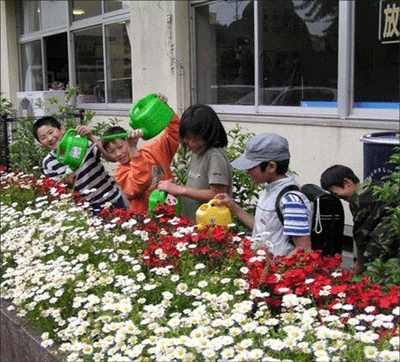 Kumamoto City is raising awareness among its citizens to reduce the use of water in the city.With corporate efforts, the groundwater pumping regulations imposed on major groundwater users, and the decline of agriculture, the overall groundwater pumping has steadily decreased since the 1980s year by year. However, due to lifestyle changes, the use of groundwater in everyday life is showing increasing tendencies. 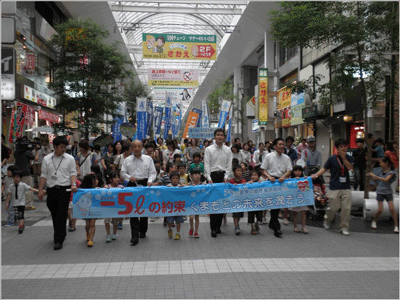 Kumamoto City has carried out various initiatives to emphasize the importance of saving water. At the beginning of the 2008, the city designated three months from July to September as the 'Water Saving Months', disclosing the amount of daily water use per person and promoting the use of water-saving devices. On April 1st, 2012, local residents, private sectors and the city government went above and beyond their respective positions and came together to form a new organization devoted to the sustainable groundwater management. 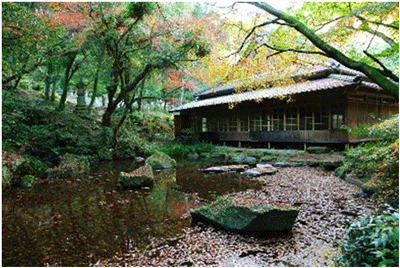 With the Kumamoto Groundwater Council as its parent organization, the Kumamoto Groundwater Foundation was incorporated and established. The Kumamoto Groundwater Foundation aims to harmonize the water usage practices of the entire community by improving the maintenance, quality and circulation of the local water supply and recognize groundwater as an important underground natural resources of the area. To tackle issues that cannot be solved within one administrative district or one municipality alone, cooperation with concerned adjacent municipalities is indispensable. Groundwater recharge in paddy fields and forests in neighboring municipalities is crucial for groundwater conservation. The maintenance of such fields and forests requires efforts and understanding by the related municipalities and the city as a consumer of water. Opportunities for the city include subsidies and purchases of agricultural land and products from the preservation areas. Advances in science and engineering have made it possible to purify water by using sophisticated technology, albeit with considerable cost and energy. Protection and appropriate maintenance of the existing natural systems will lead to the provision of public services without additional future cost, but needs to build upon proper research and understanding of natural systems. According to an estimate, dam construction and waterworks (excluding maintenance) for 100,000 tons of river water per day would cost nearly 65 billion yen (approx. US$ 7.7 billion). If Kumamoto City would have extracted water from rivers running through the city, it would need to spend a considerable amount more to remove sulfur from the Mt. Aso. The city is taking advantage of the groundwater recharge system to obtain good quality groundwater. The Republic of Moldova remains one the poorest countries in Europe, with a GDP of $7,000,318,677 USD according to World Bank data. With a total population of 3,559,000 people, 2, 70% of Moldova's poor live in rural areas, and 60% live in areas with fewer than 10,000 inhabitants. In 2005, only 4 % of the rural population had a sewerage connection. However, even having access to a house connection did not mean having access to safe water. 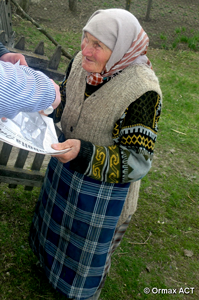 Indeed, the Moldovan National Environmental Action Plan (NEAP) calculated the social and economic impact of water pollution and reached the conclusion that polluted drinking water (rural and urban) led to between 950 and 1,850 premature deaths annually as well as between 2 and 4 million "illness days" per year. The cost to the economy of the country was assessed to be in the range of 5% - 10% of GDP. According to the Moldova's Ministry of Health, poor water quality is responsible for 25% of acute diarrheal diseases, hepatitis A, and 15% of non-infectious diseases registered in the Republic. Most widespread diseases caused by the consumption of poor water quality are chronic nitrate intoxication, dental fluorosis and gastrointestinal diseases. In 2006, only 15 % of the rural population in The Republic of Moldova had a house connection for drinkable water, compared to nearly 80% of the urban population; only 55% of the population had access to basic sanitation (pit latrine with a lid). According to recent studies, 73% of the rural population has no access to safe drinking water. 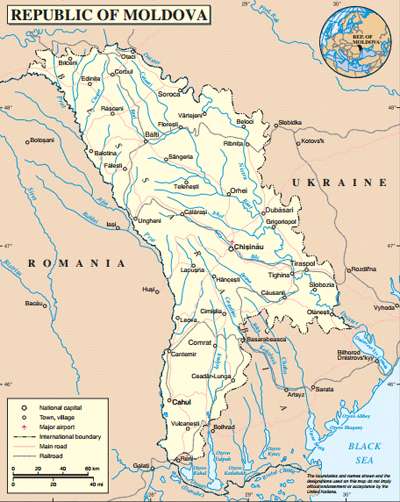 The rural citizens in The Republic of Moldova rely on small-scale water supply systems or on shallow wells which are often contaminated with micro-organism and nitrates. Latrines are the primary form of sanitation used, which is a significant source of environmental pollution. In addition, animal waste is often not adequately stored and treated, resulting in the cross contamination of water bodies. This has led to the degradation in aquatic flora and fauna in the river basins of the rivers Cubolta, Cainari, and Raut. According to surveys conducted by ORMAX ACT from 2008-10, it was discovered that nearly all macro-invertebrates have completely disappeared from the Cubolta, Cainari and Raut rivers. Primary factors of pollution such as human and poultry biological waste and sewage leaks are the chief causes for this drastic decline in aqua-fauna. In most villages along the aforementioned rivers, there are very few local strategies for improving water security. The Safe Water and Sanitation for all in The Republic of Moldova initiative was a project initiated by Ormax NGO to improve the situation in rural The Republic of Moldova by mobilizing citizens and the authorities to realize and respect the right to access safe water and sanitation through the sustainable management of local resources. Such implementation includes maintaining clean water sources to improve human health, which helps to maintain the environmental integrity of aquatic ecosystems, and thus contributes to protecting biological diversity. Objective 1: Raising awareness of rural citizens of The Republic of Moldova, through community mobilization, about their fundamental right to clean water and sustainable sanitation. Objective 2: Capacity building of Moldavian communities in developing strategies for safe water and sustainable sanitation management. 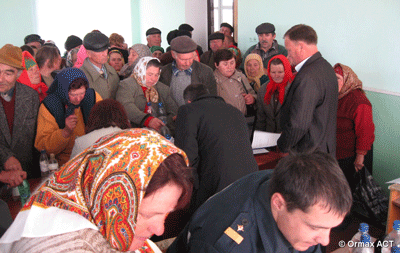 Targets were the 25,000 citizens of 10 selected villages in rural areas of Northern The Republic of Moldova. Villages were chosen that: possessed very poor access to safe water supply and sanitation relied on community and private wells, as well as rainwater stored in cement or plastic tanks. 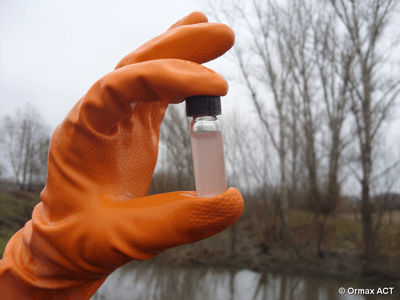 In rural Moldavian communities, severe nitrate contamination of wells is common and animal and human excreta are the main sources of contamination. 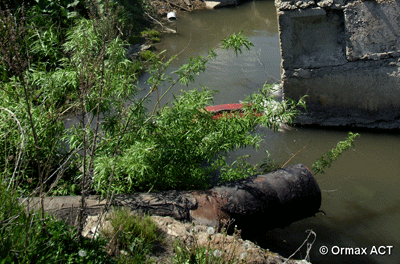 Illegal waste dumps, of which 45-50% is animal "waste", often lead to surface water pollution and unsightly areas. The common economic activities in the areas are commercial and subsistence agriculture. The reason for focusing on villages that are set along river basins was that these populations live near the most polluted zones in the country and are most in need of assistance with environmental education, empowerment in terms of better political decision making, and carrying out ecological problems as prioritized by the local authorities. The main strategy for achieving the objectives was to promote the participatory practice of including local population in all of the stages of the project, combining educational activities (workshops, trainings) with practical activities (testing and mapping the wells, identifying the sources of pollution, cleaning activities) and demonstrating solutions for effective and affordable water protection in rural area as Ecosan toilets. Local involvement in the project was very significant: in each community a village committee was established which included: the mayor, the school director, 1-2 teachers and 1-2 parents and representatives of children involved in a Water Safety Plan (WSP). The village committee was responsible for project activities, implementation and communication with the village inhabitants and the local NGO partner. Public institutions, the regional council, and the teaching inspectorate supported project activities and their regional representatives were present in the communities during the core activities. The idea was for the local citizens, especially children, in the rural areas to develop their potential for acting locally and influencing policy-making and governance from the bottom-up. The outlined participatory activities served 30,000 people (5,000 more than what the project originally envisioned) educating them on the devastating dangers of unsafe water and sanitation practice, as well as sustainable steps that could be taken for prevention and improvement. The water quality measures were capitalized on maps that are available in the village halls and people can now avoid the most polluted sources of water. The impact of the activities is visible on community's behavior: no more solid waste is dumped near the public or private wells. Spring cleaning of wells is once again a tradition in the communities where awareness was raised during the project. It is now very important that the residents remain motivated. On one hand, they can take individual efforts for the protection of the water and their own health but, on the other hand, they have to continue to advocate with the authorities to ensure the proper governance of obligation. The empirical results of the program can be used as tools for the people of rural The Republic of Moldova as they lobby their authorities for better water infrastructure. 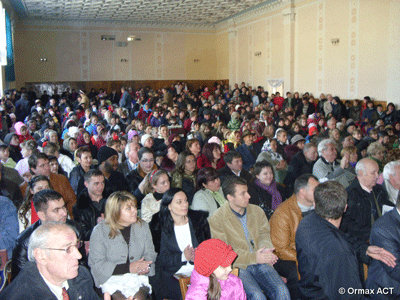 Namely, the number of leaflets distributed, wells tested, meetings and workshops held, have all superseded the original planned numbers and now serve as parts of the toolbox that the people of The Republic of Moldova have. Public awareness has increased due to project activities: in all communities people are now aware about the negative impacts of substandard water quality on the human health, as well as the linkage between human and animal waste. The project has been a rich experience not only for the schools, but for the target villages as well. Participants agreed that the project was useful, though some expressed a feeling of being overwhelmed by the extent of the problems. In words of one project participant, "We learned much about our drinking water – how it is now and how it should be. We'll try now to change things". 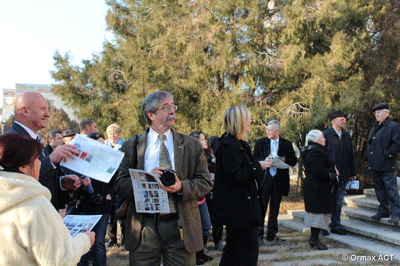 The public participation was a determinant factor in the success of the project. However, only combining awareness raising activities with practical and demonstrational activities with an evident impact on people's life could the project maintain the public's cooperation and continued interest. Talking about the water quality without providing evidence that testing yielded would ever have gotten peoples' attention. This is also true about the sources of water pollution without identifying them. In conclusion, public involvement can be achieved only if the methods, the issues and the activities are adapted to public needs and capacities. Lesson learned was that in order to effectively introduce community based approach initial community mobilization and adapted trainings on relevant technologies are needed. Another factor of success was the authorities support and participation. The initiative involved local, regional, and national authorities in all the activities and found that their support motivated public participation. Besides capacity building for local authorities, the project organized a national conference putting together responsible bodies for water, sanitation and people's health. The results shared and the exchanges facilitated led to the definition of a certain number of activities in achieving the effective implementation of the right to water and sanitation in The Republic of Moldova. This strategy was sent to the ministries of environment and health and some of the proposals were integrated in the national strategy for water protection: the WSP were recognized by the national authorities as an effective tool in water protection at community scale and they are recommended by national authorities to be implemented in rural communities in order to protect the water resources by identifying the risks and reducing the water resources sources of pollution. In this particular project, the importance of involving authorities in the activities was crucial for achieving the project objectives and insuring the project sustainability. Developing activities with national authorities at all levels was a way to guarantee the coherence of the activities with local community's needs and possibilities and also a way to insure the sustainability of the activities after the project achievement.